Art depots are the distribution warehouses of the art world. They're tucked into anonymous buildings on the outskirts of town, housing works that aren't on view. 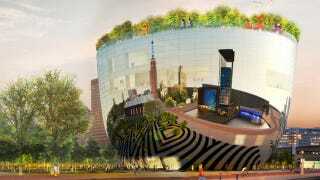 But in Rotterdam, the architects at MVRDV have won a competition to build a depot that will be open to the public. The depot will be built to house the precious art collection of Rotterdam in collaboration with the Museum Boijmans Van Beuningen, a prominent art museum that looks like you'd expect it to look—traditional. In that light, MVRDV's depot is a little bit of an experiment. Inside its mirrored facade, visitors will be able to peruse parts of the collection that aren't on display, plus aspects of the logistics side of art, like how it's handled, restored, and moved. Up top, there's a sculpture garden and a cafe. One of the most intriguing things about the depot, though, is the fact that private art owners will be able to rent out rooms to store and show their collections. MVRDV compares it to sky boxes at stadiums—except for art.